To see what our eyes cannot see – whether by distance or wavelength, that is the challenge. Scientists exploring the infrared universe have developed many ways to meet this challenge. At this month’s Stars at Yerkes workshop, teachers got a glimpse of what these scientists see, as well as how these views are created. “Seeing the Unseen” was the theme of the workshop devoted to the SOFIA mission. SOFIA, the Stratospheric Observatory for Infrared Astronomy, is a joint mission of NASA, the German aerospace center DLR, and USRA (Universities Space Research Associates). 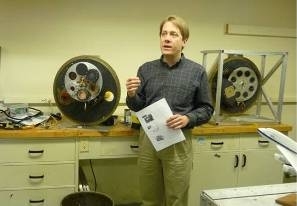 The workshop began with a talk from the University of Chicago’s Al Harper about the history of airborne astronomy. Describing his early years of research at Rice University, Al discussed the challenges of stabilizing a telescope in a Lear jet in the 1960’s, and the applications of that learning to today’s SOFIA mission. In another keynote session, Yerkes engineer Marc Berthoud treated teachers to a tour of the Yerkes laboratories where his contributions to the HAWC (High-resolution Airborne Wide-band Camera) instrument are made. HAWC is one of the first-generation instruments for SOFIA. Teachers were interested with how the electronics of the instrument were kept at super-cool temperatures to distinguish distant objects from “noise” within the camera itself. A third presentation was made by ARCS teacher Lynne Zielinski. 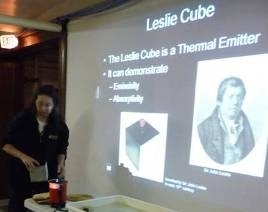 In the session “From Steam Engines to Stars,” Lynne took participants through a series of classroom-ready demonstrations which illustrated concepts of black body radiation, absorptivity and emissivity. Teachers tested their ideas of these concepts using the Leslie’s Cube and toy steam engines. Another favorite demonstration was observing an object in the interior of a light-proof box. Workshop leader and ARCS teacher Kathy Schmidt organized the day with a compliment of breakout sessions. Pulsar teacher Kathy Gustavson described how signals from Very Low Frequency (VLF) waves produced by lightning, get dispersed when traveling around the Earth and along magnetic field lines in the magnetosphere. These phenomena help us understand how electromagnetic waves produced in the universe get dispersed on their way to Earth, which also helps us find the distance to these pulsars. In another session, Margie Corp offered teachers a way to separate reflected light into its wavelengths of colors using ALTA II reflectance spectrometers. These instruments allowed participants to collect data and graphically see how a piece of orange paper reflects different amounts of light in varying wavelengths, including infrared. A highlight of the day was a session led by Bernhard Beck-Winchatz from DePaul University in Chicago. In this session, Bernhard first illustrated how cell phone cameras were infrared detectors. 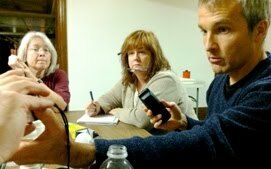 Participants examined how their cameras were able to “see” the infrared impulses made by household TV remote controllers. Bernhard then led teachers with the construction of their own IR filter adapters for their own point and shoot digital cameras. 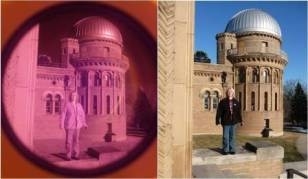 Participants enjoyed experimenting with their adapters, photographing the Yerkes Observatory grounds and revealing the infrared world. Peggy Piper is selected as one of six teachers to fly on SOFIA!! Read all about it here. Congratulations Peggy!! What lies beyond what our eyes can see? Stars at Yerkes teachers can tell you – these views are worth discovering!